 Aaron drilling uses environmentally friendly hydraulic oil in all our drilling equipment. Since our company's founding in 1979, Aaron Drilling remains committed to the professional development of our most precious natural resource — fresh, clean water. With a team of the best water well drillers in Alberta, Aaron Drilling is a company offering more than just water well drilling; we provide potable drinking water to thousands of acreage owners, farmers, and even entire towns all over Alberta. We’re also available to service all your pumping system, production testing, and well maintenance needs. Our team's many years of experience and state-of-the-art equipment, combined with some of the water well industry’s most knowledgeable and skilled workers, ensure you get the best results — not to mention the dedicated, superior service you won't find anywhere else. Are you looking to start a water well? Wanting to learn about the typical water well drilling cost for Alberta homes, businesses, and acreages? Feel free to contact Aaron Drilling at any time. Did you know water acts as the basic ingredient for life? As our society grows, our understanding and appreciation for water must also grow. Aaron Drilling is committed to professionally developing and educating people on the importance of the world’s most precious natural resource. Check out this video—“Hidden Water” – Alberta’s Ground Water System—to see where our largest supply of fresh water can be found in Alberta and other places around the world. 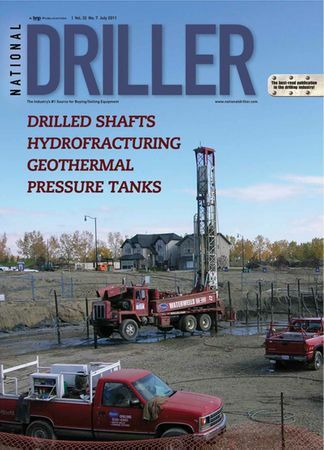 Aaron Drilling was featured on the cover of National Driller Magazine, providing services for a geothermal heat exchange system at the Drake Landing Solar Community in Okotoks.